It may only be September, but Halloween is just around the corner (believe it or not)! In our family we love dressing up and gifting candy to our neighbors every year. This year we decided to throw this fun Halloween Glow Party to kick off the season! We filled the table with delicious Hershey’s candies, fun themed recipes, crafts and spooky spiders! For anyone with even a touch of arachnophobia this party was very creepy. 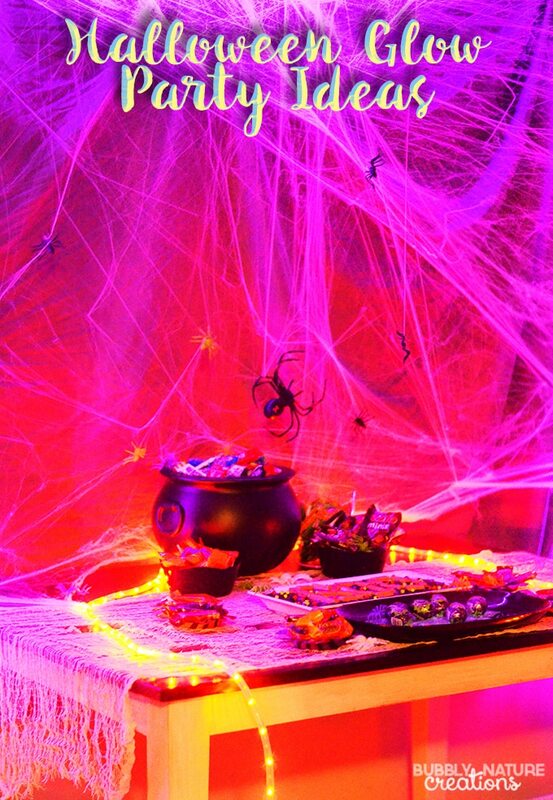 You might just get brushed by a spider if you dare grab a sweet treat at this party! 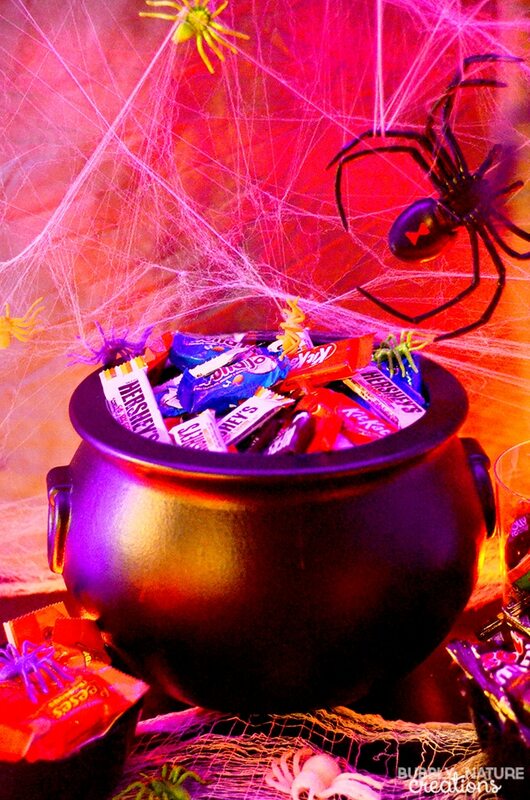 We had a cauldron filled with brightly colored Hershey candies and I love the way they glowed under the lights. Hershey adds fun and fantasy to any Halloween celebration and we made sure there was plenty of Hershey’s candy to go around. Hershey helps families harness the magic of Halloween by sharing new and classic treats that help transform any Halloween party. 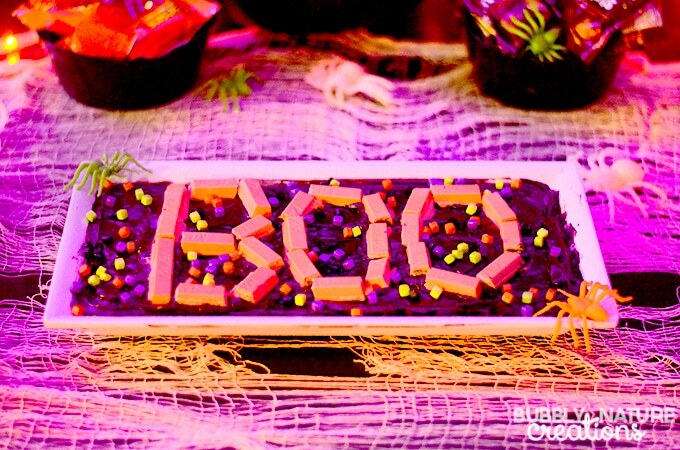 We used orange Kit Kat® bars to make these fun BOO brownies! Just break the Kit Kats® in half and form them into the letters or make your own design. These Kit Kats® are bright orange which really glowed under the black lights! To make the whole party glow I used black lights and rope lights in orange and purple. That’s all it took to make an eerily glowing tablescape! The spider web background was made with the same spider webbing you can find at most stores this time of year. I love how it easily glowed under the lights. It’s getting easier to find Halloween themed party supplies because Americans of all ages celebrate Halloween – in fact, 34 percent of people attend or throw Halloween parties. The Cadbury Screme Eggs were a bit hit! 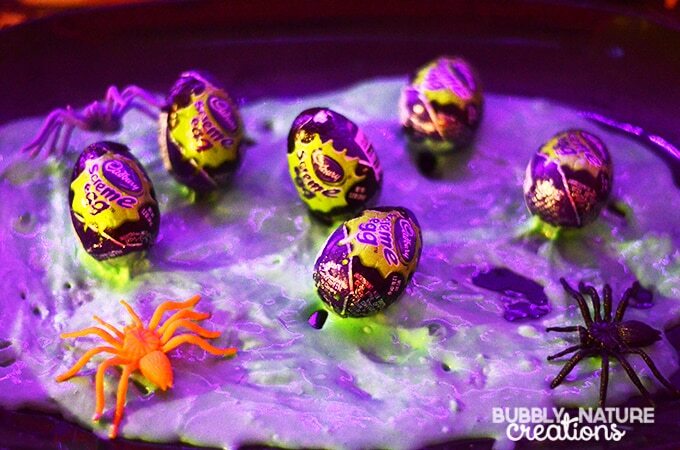 I used some homemade slime which I placed on a black plate and stuck the eggs in the slime. To make your own slime watch this video. I added some spiders for an even spookier effect. Inside the Cadbury Screme Eggs is a green and white center instead of the typical yellow and white egg. They were really a fun treat to serve and eat! In addition to the Cadbury Screme Eggs Hershey’s has something for everyone like Reese’s Peanut Butter Pumpkins, and Hershey’s Candy Corn bars! This party is simple, but very fun and festive! Be sure to visit Hershey’s for more Halloween party ideas, for more costumes & crafts and for more Halloween recipes!